In 6 months in SE Asia, I was determined to write every single day. No exceptions. I didn’t realize how ambitious my goal was until I began the trip. Finding time to write was not the biggest challenge. There was plenty of time on buses, trains, waiting for flights, and at the end of a long day on the bed of my hotel room. After all, I didn’t work. I wasn’t studying. Time was all I had. But it was so incredibly difficult to write. Because I didn’t know what to say. I would sit in front of my laptop and completely blank. It wasn’t a matter of writing for the public, it was about writing for myself. I always hoped to have something thoughtful and profound, but many days nothing would inspire me. Still, I know it would be a great waste if I didn’t keep a consistent diary abroad, so I decided to change my tactic. Instead of sitting down to write a “diary” entry, I began intervening myself. “Describe where you are,” was the first prompt. I as not in the same place every day. Even when I was, the place was always different with new people, new music, new conversations, and new sunlight. It was never the same place as the day before. At first this seemed tedious. After all, I can just takes pictures of the place and have a visual record that will last longer than memory. But the camera cannot hear, cannot smell, cannot feel. My descriptions are more valuable than my photos because my own experiences inform them. Thinking about, and then writing out my feelings at that precise moment was a way of bringing myself into the present. First I built awareness of my surroundings in the descriptions, then I built awareness of myself. The feelings did not need to be profound, sometimes – oftentimes – they were just rants of any present frustrations. “I am always too hot, too tired, or too busy to connect with my feelings. “I don’t think I am a failed traveler just because I'm getting melancholy on this trip. Just like I wasn’t a failed ex-pat when I got melancholy in Japan. 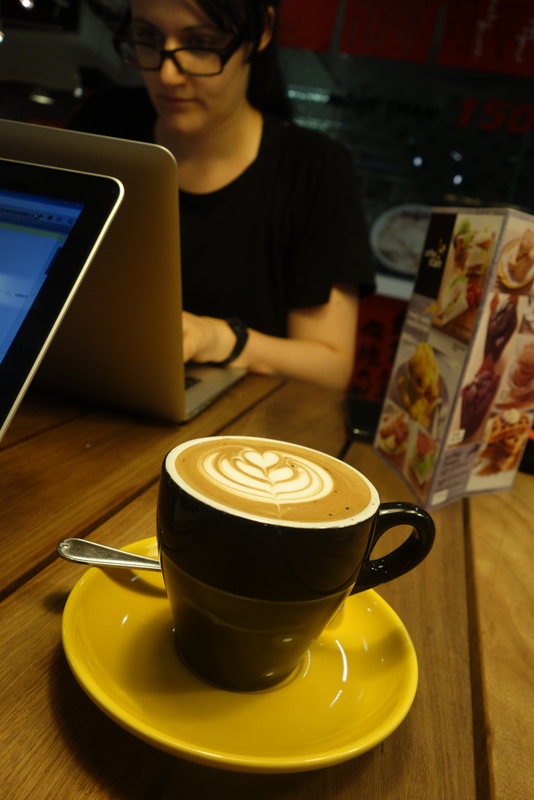 Perhaps my only real mistake is that I didn’t expect this,” I wrote from a café in Bangkok. That day I wrote 3 times, beginning just after midnight at 12:03am, then again from a café at 1:10pm, and from another café 9:07pm. It was a big long philosophical rant about my life. The second runner up was in Yangon, where I dictated my descriptions from the train into my iphone. The train was far too shaky for me to write, so I spoke my diary entry into my phone and transcribed them into my diary while on a boat in another part of Myanmar. I had a small breakdown in Hua Hin, where I felt the most depressed and miserable I had since the trip started – and I wasn’t even a month into it! “On a short vacation, I can reflect on what I experienced once I go home. But here, moving from place to place, I am tired. I can’t reflect on the last place because I am trying to absorb the current place. I wrote the most in border crossings from Thailand to Laos – specifically Chiang Rai (1518) and Houay Xai (1211). In both cases, I was only in each place for one day waiting for the next mode of transportation to take me to my next place. A close runner up was again Yangon, Myanmar where I wrote an average of 1,052 words per day. That city inspired me so much, I never had a shortage of things to say about it. I wrote the least in Jahor Bahru, another border crossing taking me from Singapore into Malaysia. I wrote precisely 0 words in Jahor Bahu and I remember detesting it and being eager to get out. As close runner up was the city of Mandalay in Myanmar, where I wrote only 221 words per day because I got sick and felt depressed. Honestly, when I analyzed these statistics they surprised me. I had thought expected Chaing Mai to be the place I wrote the most per day since I returned there for a month at the end of my trip for the express purpose of writing. I was also surprised by the average length of my entries. Apparently I did have a lot to say about my surrounding and my feelings. In memory, my diary was just a long ramble of useless thoughts and observations, but when I went to re-read it, two years after travel, I was struck by its poignancy and specificity. Most of the entries read like a narrative, shifting between external and internal observations. This diary has been pure gold to me. It my favorite and most valuable souvenir. It’s depth and breadth far outweigh anything captured by my photographs or other archiving techniques.